If you would like to know how to use this feature with a barcode scanner, visit our Box Content Scanning – Private Workflow article. Click on the name of the shipment in the upper window on the Box Content Information page that needs Box Content Information. 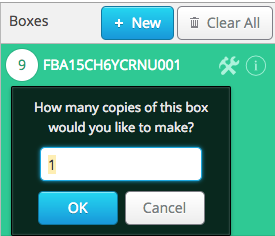 We automatically create the first box for you, as is shown in the panel to the right side of the screen. If you need additional boxes, click on the +New button to create a new box. Click the drop down arrow next to Assign, choose the box you’d like to put your items in, the quantity you’d like in the box, and click Assign. 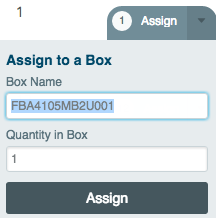 If you only assign a portion of the quantity of an item in your shipment to a box, you will notice the remaining quantity still has a gray Assign button next to it. This indicates that you have more of the item that has not yet been given a box designation. You can see the total number of items left to assign in a shipment at the bottom left of the page. A green box for all quantities means that the entire amount of that MSKU going to that fulfillment center, have been successfully assigned to a box. If you need to make sure you don’t overfill your boxes, and want to monitor the weight of the box as you add items, you now have that option! We use the weight of the items in a box to determine an estimated weight size. This will help you know when you are getting close to the box content weight limit. This expands the window, providing your box content information for that particular box. Once expanded, you can see the items listed in box (either by MSKU or FNSKU) and the estimated total weight as you add to the box. The weight is based on the item package weight of the items in the box, estimated to the nearest hundredth of a pound. • Print Box Packing List – this action allows to print a packing list for your box. If you need to remove a box, you click the action button next to the box name and select Remove Box. A pop-up will appear to make sure the box should be removed. If the box contained any items, those items will need to be reassigned to a new box. If you tend to have a large amount of boxes per shipment, you can create them in bulk a couple of different ways. 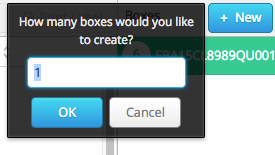 *Since one box is auto created, be sure to input how many remaining boxes you need. So if you need 5 total, input 4 to create 4 more boxes in addition to the existing one. If you need to create multiple boxes with the same items, copying boxes may save you some time! Empty boxes cannot be copied. For steps to bulk create empty boxes, please reference the steps to Bulk Creating New Boxes above. Generally, sellers have a preference on if they want to see MSKU or FNSKU when packing boxes. *This action will toggle the view for ALL items in all boxes and the view will be remembered for future shipments. To change this view, click the action button next to the box name and select Show FNSKU (or MSKU) from the dropdown menu. Show FNSKU will be in the dropdown of the Actions icon list if it is currently displaying MSKUs. Click the small “i” to see the MSKUs/FNSKUs in the box. Once you have assigned all of the items to boxes for every shipment, click the Transmit All Boxes to Seller Central button in the lower right hand corner. You can also send them one-by-one by clicking ‘Transmit Box’ next to each shipment. After you have completed your batch, wait a few minutes for a green success message. Once it appears for a shipment, that specific box content information has been accepted by Amazon. If you select Transmit All Boxes and receive an error for one shipment, you will need to resend them all. If you do not successfully send your box content information without error, you will not be able to proceed in Seller Central. 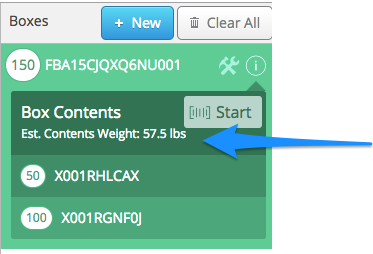 If you need to edit your Box Content Information after you have already completed your batch, you can do so easily! See: Editing Box Content Information – Private Workflow for details.